The Social History of Bourbon relates somewhat chronologically the role played by bourbon in American politics and history, then bogs slightly as it ends with chapters on whiskey tall tales, a look at the pre-Prohibition barroom, and enumerations of great Americans who tippled and then some. The earliest American distillates were rum, made from Caribbean molasses, and apple jack (calvados), from ever-increasing orchards. But with the arrival of Scottish and Irish immigrants, many of whom brought stills, interest shifted to distilling grain alcohol as they had done at home. The stony soils of Maryland and Pennsylvania were most suited to growing rye, a spicy European grain, and here rye whiskey became the staple. But as people headed down the Shenandoah Valley and crossed the Cumberland Gap into what is now Kentucky they grew Indian corn, or maize, which produced much more alcohol per bushel and yielded a sweeter whiskey. Incidental barrel aging occurred during long months of river transport to southern markets, particularly when whiskey awaited spring flooding before shipping. However, once aged whiskey began to command higher prices the word ‘old’ quickly found its way onto cask heads. Early bourbon may have left the distillery in good shape, but middlemen at every turn were wont to adulterate it with water, neutral grain alcohol, peppers, tobacco, and even strychnine just to stretch it out and increase their profits. It wasn’t until the invention of the inexpensive bottle that people could count on their purchases actually being bourbon. The difference, once tasted, was so dramatic that bottled whiskey soon commanded a premium price and a large share of the market. It seems wherever there is great enterprise there is whiskey and a government that wants to tax it. Carson goes to lengths to recount the positive, probably essential role whiskey played in opening up the American West and financing America’s early governments. He also recounts how whiskey taxes led to all manners of protest, revolt and evasion. “The power to tax involves the power to destroy” he quotes Chief Justice John Marshall as saying, but it was legislated Prohibition, not taxation that really did almost destroy bourbon. Though it touches on Prohibition the book focuses more on the role bourbon whiskey played in the lives and society of America and Americans from the earliest colonial times to the early 1960’s. Alcohol came to America with the Pilgrims he tells us, and many prominent Americans, including the first President were distillers. The temperance movement, he reminds us, promoted moderation, not abstinence. How temperance hardened into Prohibition is not so much explained, as described and we can almost see Carson shaking his head in disbelief at governments giving up such a goldmine of taxes. Enacting Prohibition was like putting organized crime on steroids but we are led to wonder what the bourbon industry might have become had its manufacture not been dealt such a permanently crippling blow. Canadian and Scotch whisky distillers can smile though, for with bourbon-making outlawed a generation of bootleggers made these lighter potations the American favourites they remain today. Early American clergy often made and usually partook of ardent spirits. However, Carson questions whether the Baptist Reverend Elijah Craig was really the first person to distill Kentucky bourbon and reminds us that Craig was a Virginian and not from Bourbon County. Dr. James C. Crow, a Scottish physician, gets full credit, however, for inventing the sour mash process. Visit Jack Daniels distillery and people may talk of an old Daniels family Mint Julep recipe. It involves placing mint leaves and sweet syrup into a glass. The whiskey is then poured into a well-frosted container, the rest of the ingredients are thrown away and the whisky is enjoyed neat. Carson knows this story too, only in his telling it originated with Louisville journalist “Marse Henry” Watterson and there is no mention of the Daniels. Ah such is the lore of bourbon. 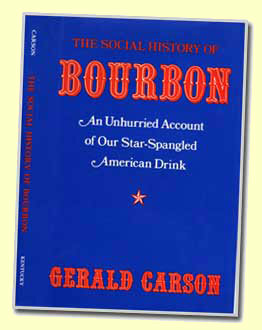 Carson also introduces several bits of bourbon trivia that have since found their way into many a subsequent book. The “No Chemists Allowed” sign at Old Fitzgerald is one such nugget. So too is the observation that bourbon is as emblematic of America as Scotch is of Scotland and wine of France. Many authors since have found one way or another to make this observation, just as others begin, as Carson did, with the Roman expression abusus non tollit usum; abuse is no argument against proper use. Fourty-odd years after it was written, and nearly twenty years after author Carson’s death at 90, The Social History of Bourbon remains one of the most enjoyable books in the bourbon literature. Though long out of print, it’s a must read for the bourbon aficionado, but more recent authors should take care to distil rather than recycle its contents.